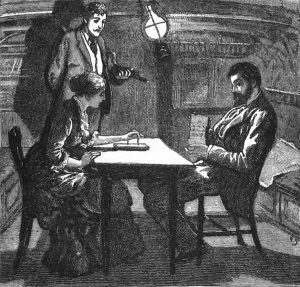 Illustration by William Small from the first publication of the story in The Cornhill Magazine, January 1884. 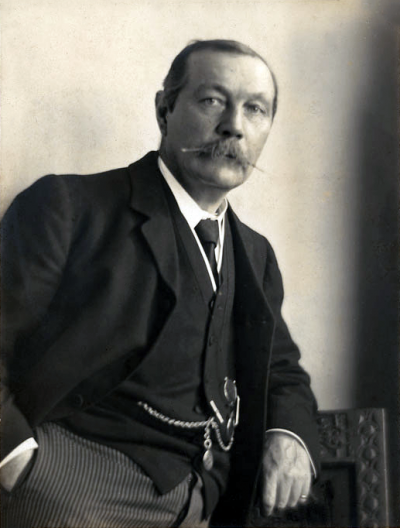 One of the first real successes of Conan Doyle’s literary career was the publication of J. Habakuk Jephson’s Statement in 1884. The short story was published anonymously in the prestigious Cornhill Magazine. 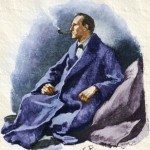 Conan Doyle was paid almost the equivalent of a year’s rent for the tale. It also stirred up some controversy. The fictional story was based on true events, the story of the Mary Celeste. On December 4, 1872 the British brigantine Dei Gratia was about 600 miles off the coast of Portugal. The lookout spotted another sail on the horizon. As the two ships grew nearer Captain Morehouse of the Dei Gratia recognized the other ship as the Mary Celeste. The Mary Celeste, under the command of Morehouse’s friend Benjamin Briggs, was in trouble. Some of her sails were missing while others flapped uselessly in the wind. Most alarming of all was the fact that there was no one at the wheel. Morehouse and some of his crew boarded the Mary Celeste. They discovered that the ship was relatively undamaged. They even located the missing sails. The cargo was intact. There was plenty of food and water aboard. However there was no sign of Captain Briggs, his wife, their daughter or any member of the crew. Morehouse did note that the lifeboat was missing. However the evacuation must have been done with incredible haste. No supplies or personal belongings seemed to be missing from the ship. If Briggs and the rest did go into the lifeboat, they must not have had much more than the clothes on their backs. What could have happened to force an experienced captain to order such a speedy evacuation of a seaworthy ship? No one will ever know. No crewmember or passenger of the Mary Celeste was ever found. 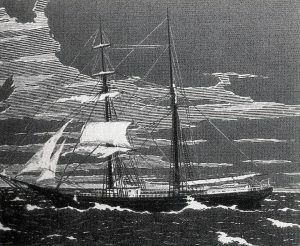 An engraving of the Mary Celeste as she was found abandoned. In J. Habakuk Jephson’s Statement Conan Doyle wrote about an abandoned vessel named the Marie Celeste. In this story the ship was taken over by a black passenger. He and his fellow conspirators commandeered the ship, sailed it to Africa and murdered the passengers and crew. Conan Doyle’s tale was so vivid that it raised protests from people who mistook the work of fiction for an article. Frederick Solly Flood, Her Majesty’s Proctor and Attorney General at Gibraltar had been in charge of the salvage of the Mary Celeste. He stated that J. Habakuk Jephson’s Statement was “a fabrication from beginning to end”. He further stated that this false account might damage England’s relations with foreign countries. At the same time U.S. consul Horatio J. Sprague asked Cornhill Magazine to investigate the origins of the fraudulent article. 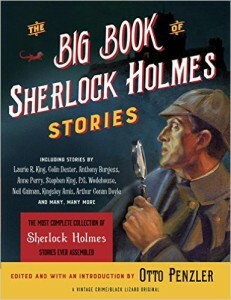 Conan Doyle was pleased that his short story was so well done that it could be mistaken as a true accounting of events. He was also delighted that hundreds of readers, who did understand the work was fictional, thought it was written by a man known for his tales of adventure. They suspected that the anonymous author was none other than Robert Louis Stevenson.